London’s Regent Street was pedestrianised for four consecutive weekends in July, with all sorts of entertainment provided by the shops and businesses along the street. I went to the festival with a friend and my four month old, not really sure what to expect, and we had a great time. 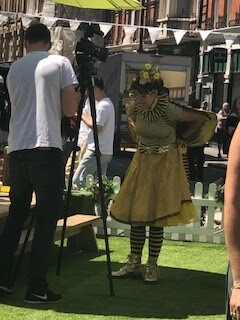 There was a large display about the importance of bees - apparently some of the buildings in this area have bee hives on their roofs - where children could get involved in various activities and meet a lady dressed as a bee. Hamley's toy shop had a man blowing bubbles up and down the street outside and a promotion in store where we were able to get a free teddy for my little girl; Holister had deckchairs and giant inflatables, there was face painting, free samples from Whittards (I love their instant iced tea) and various food stalls. 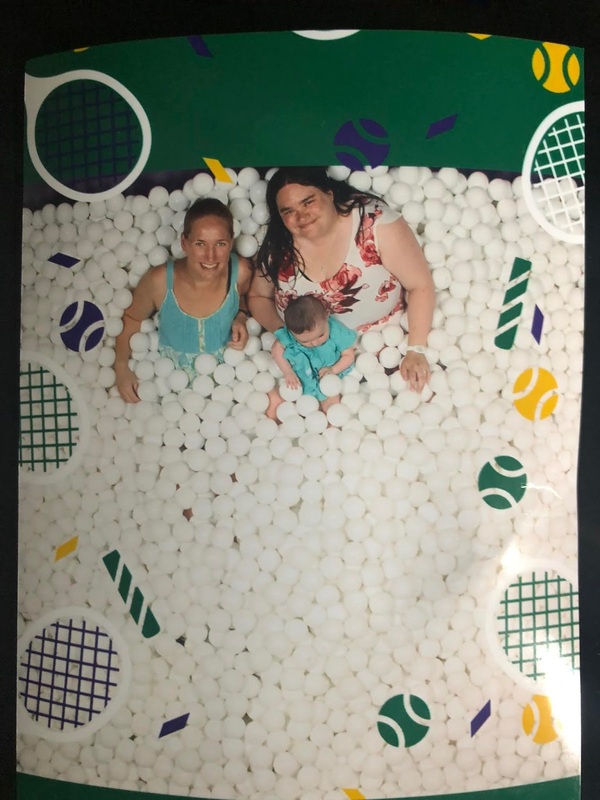 My favourite part was the Wimbledon-themed ball pond outside Ralph Lauren Polo, where you could climb in and have your photo taken from a camera above; we were then given prints of the photo straight away (free of charge) and I gave my phone number for a digital copy of the photo to be texted later - but when it arrived they had sent me a stranger's photo! Still it was a really fun experience and a lovely day out. 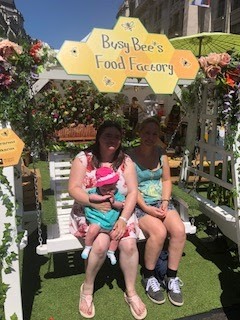 There were lots of food stalls which looked very tempting including Gaucho and Ham Yard Hotel but we decided it would be easier to sit down in a café or restaurant, as baby S would need feeding and changing as well. We cut through from Regent Street to Ganton Street where there were several restaurants that looked good but most appeared very busy. I spotted the Diner, a larger restaurant with more space inside, and asked if they could accommodate a buggy as I knew most of their tables are fixed booths, but they took us to the back of the restaurant to a table that had fixed seating on one side and movable stools on the other. The greeter even helped carry the buggy up two small steps to get to the table, and helped move the stools so I could get the buggy next to the table. I've been to the Diner in Spitalfields several times and really like the food but this was the first time I'd been in with a baby in tow. She had her milk as I was reading the menu; when the food arrived we posed for a photo and baby S tried to grab my friend's burger! 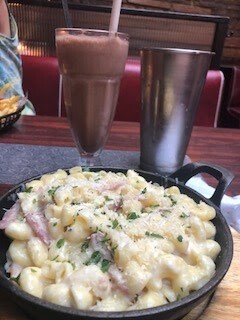 My friend had a chicken burger and I went for the macaroni cheese with bacon; I would have preferred the bacon a bit crispy but the dish was really nice and very filling - though that was probably because I also had a Snickers milkshake as a treat with it! We were then joined by a vegan friend and I was pleased to see the Diner had a couple of vegan options - a burger and a vegan version of the mac and cheese, and some of their locations including Spitalfields now have a completely separate vegetarian and vegan menu. If you are wondering about visiting with a baby, they do have baby change facilities in the ladies toilet, though when you pull down the wall-mounted changing table you are actually blocking access to one of the three toilet cubicles, and I wasn't sure people would be too thrilled I was changing a poopy nappy right next to the sinks as the baby change isn't in a separate cubicle but in the main part of the ladies, though they don't have a huge amount of space and it was better than nothing. Overall I'd say the Diner is definitely baby friendly and was a good place for us to sit down for a while and eat lunch while we enjoyed the Regent Street festival.